You are currently browsing the category archive for the ‘Breakfast’ category. So, I have been hosting World Cup viewing at my house for a couple weeks. We’re in Alaska, so the games played in Russia are early in the morning here. I’m trying to serve breakfast-type snacks to the assembled bleary-eyed hooligans, along with their coffee. Since the rhubarb is ripe, there’s been a lot of rhubarb bread. This egg muffin has also turned out to be quite nice. It’s very easy to make and keeps well in the fridge for several days. Preheat oven to 350 degrees. Prepare a 12-muffin tin by spraying with non-stick spray or greasing very well. each one, or you can make each muffin cup a different flavor. Beat the eggs and optional half-n-half with salt and pepper. Pour just a little into each muffin cup to coat the bottom. Sprinkle a little of each of your vegetables and meat into each muffin cup. Sprinkle grated cheese into each muffin cup. Fill each muffin cup up with the remaining egg mixture. Don’t overflow any of the cups, but being a little short won’t hurt anything. Bake at 350 degrees for 20-22 minutes. I like to see a tinge of golden brown across the top of mine. Eat right away or chill and eat later, reheated or not. I usually chop the vegetables and meat the night before and put them into little plastic baggies. 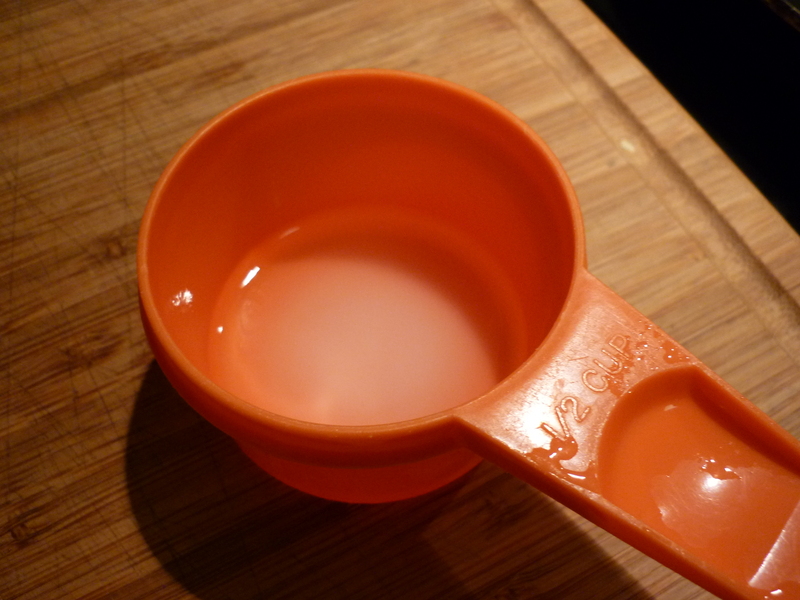 Then I shove the baggies into my 4-cup measuring cup and put it into the refrigerator. In the morning I spray my muffin tin, take the measuring cup out of the refrigerator, and remove the bags of vegetables. I crack open the eggs into the measuring cup and beat well, adding salt, pepper, and a splash of half-n-half. Then I proceed as listed above. By the time the oven is preheated I’m ready to pop the egg muffins into the oven. This recipe is based on one found in my church’s old cookbook. It was submitted by my friend Jonna’s sister. Everyone at my house loves this. I don’t make it often because it takes awhile to prepare and bake. The original recipe calls for a 5-1/2 oz. pkg. dry hash brown potatoes with onion. Betty Crocker brand used to make it, but it was discontinued. I’ve tried several other brands of dried hash browns and as long as you keep it to approximately 5 oz or an amount that the package says serves 4 people, you’ll be fine. I like to add a pinch of dried toasted onion, too. Prepare about 5-oz. dried hash browns according to package directions. While that is underway, start preparing the next part. Stir in 2 cups milk. Cook and stir constantly until thick and bubbly. Remove from heat. 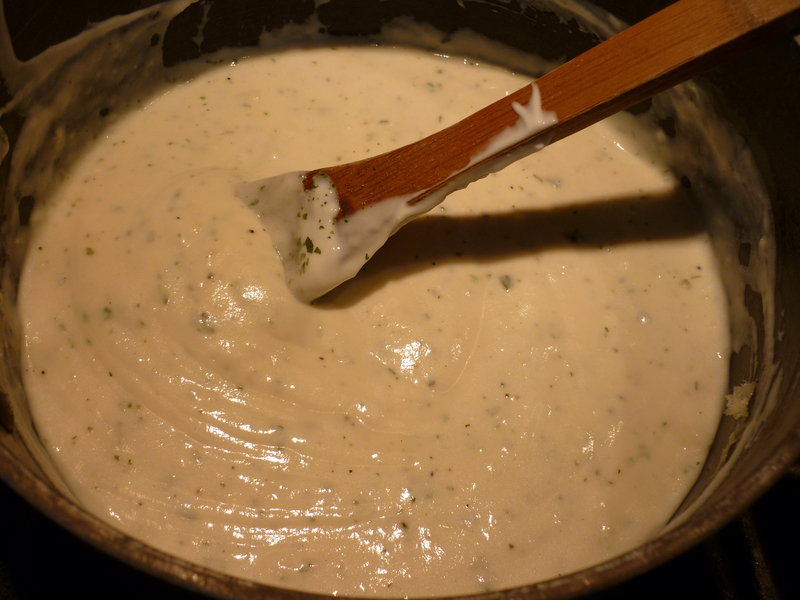 Stir in 1 cup sour cream and 2 Tbsp. snipped parsley or parsley flakes. 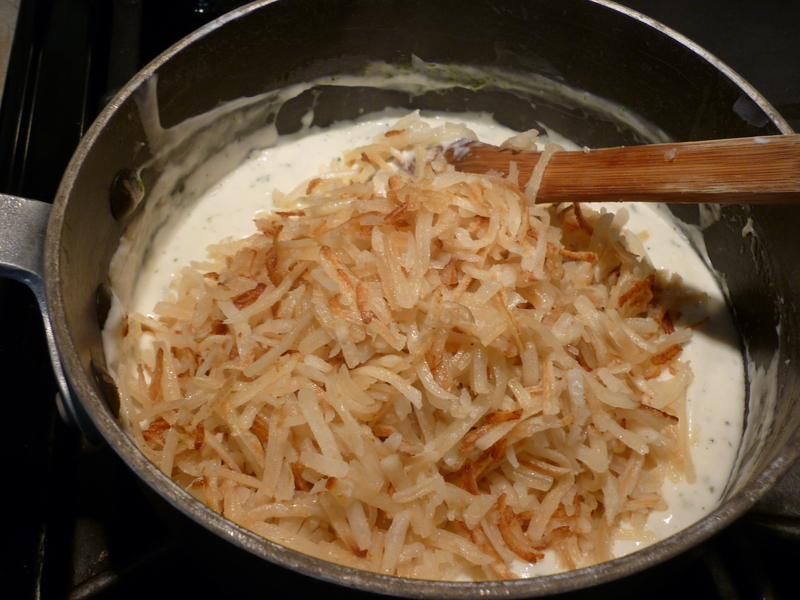 Stir the hash browns into the sour cream sauce. 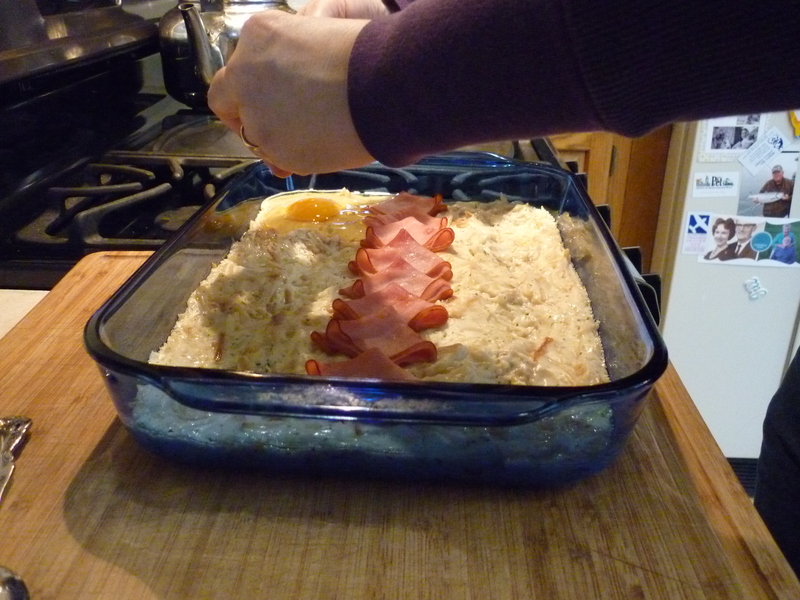 Pour into greased 9×13″ baking dish and smooth it with spatula to evenly distribute in the dish. 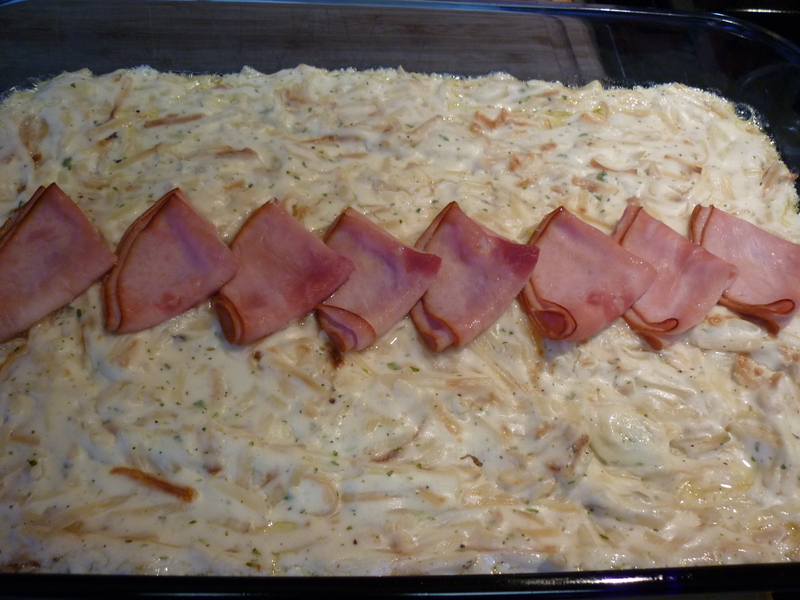 Layer 8 slices Canadian bacon or ham lunch meat or leftover ham slices along the center of the dish decoratively. I used ham lunch meat rounds, folded into quarters, for today’s illustration. 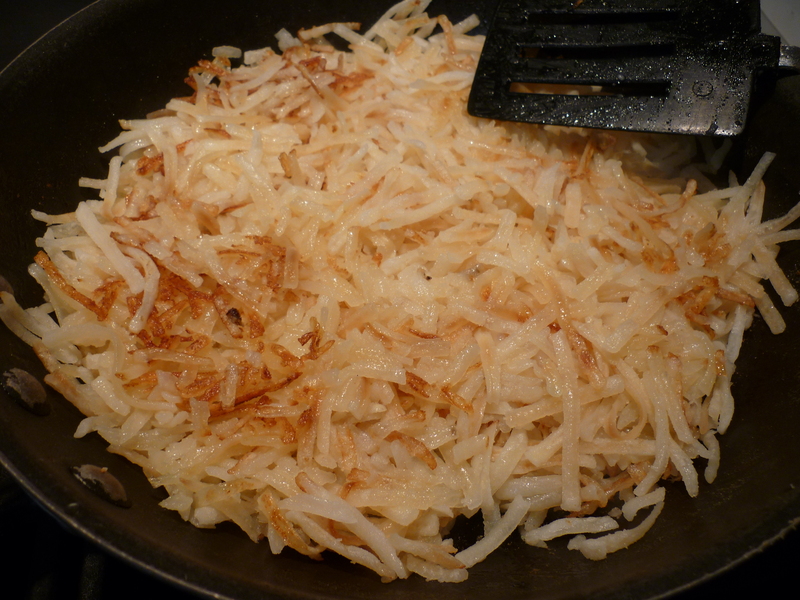 Remove from oven and, using a tablespoon, press 8 indentations into the hash browns. Carefully crack an egg into each indentation. 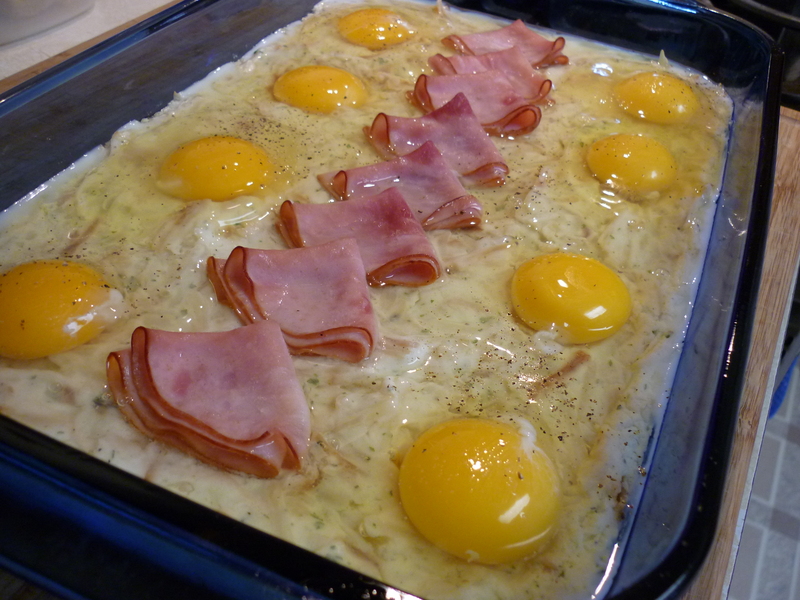 Bake an additional 10-15 minutes until eggs are set. Serves 4 hungry people or 8 other types. Really good with a bit of Tabasco splashed on top. 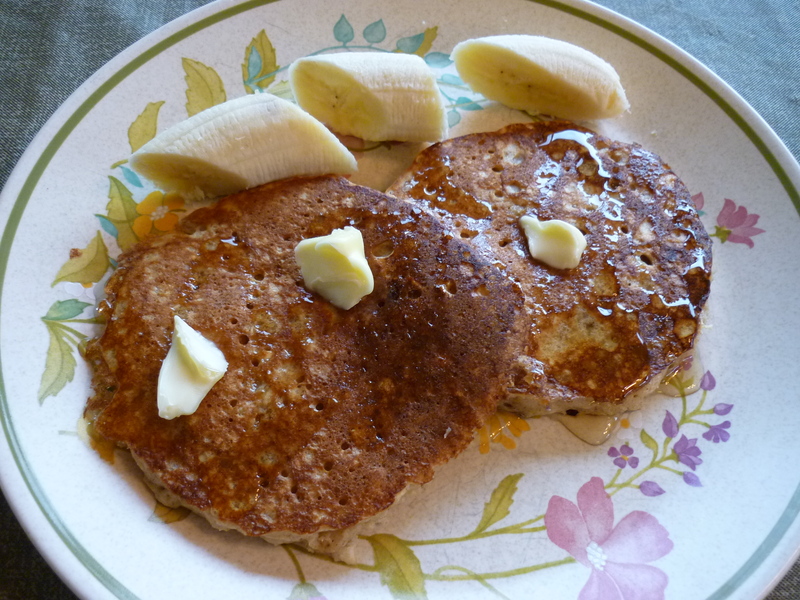 Alert: sourdough pancakes require planning. You can’t wake up in the morning and decide to make them. You must have a starter, or create a starter from scratch, and activate it at least the day before. The older your starter, the more sourdough flavor in your recipes. I’ve heard of people keeping their starter active for years and years, sharing and handing down to the next generation. As a child I remember waking up one morning to the smell of pancakes frying. Oh, yum. 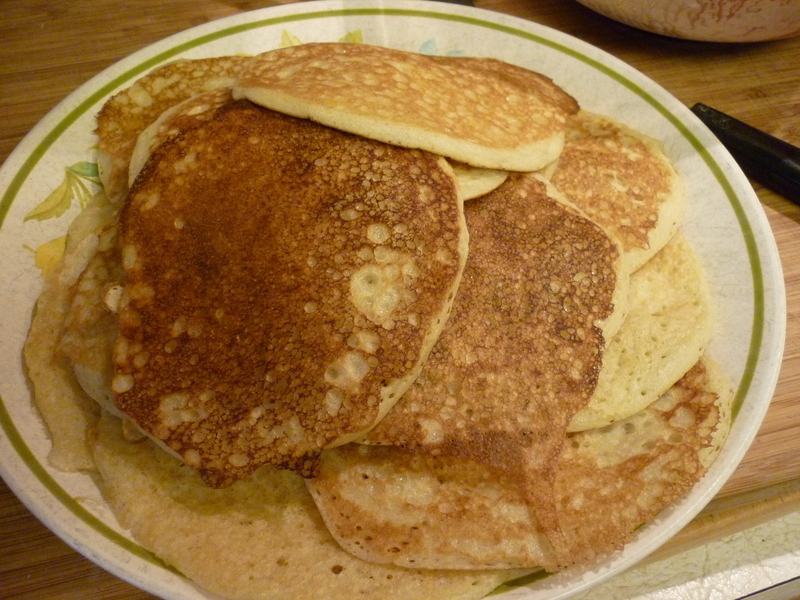 Don Bruckner was staying at my house for a few days and treated my family to sourdough pancakes for breakfast. That morning he told me about the time he made sourdough pancakes for a huge group out in one of the villages and he mixed up the batter in the bathtub because it was the only container big enough. That’s a mental image I cannot shake. What I don’t know about sourdough could fill several volumes. There is science involved in the whole process. I’m all about easy, so I don’t care to know why it works. I do not have an ages old starter, nor have I ever kept a starter for more than a few months. Here is how I do it, right or wrong. The starter recipe I use to get going is based on the recipe Quick, Overnight Sourdough Starter in Rita Davenport’s cookbook, Sourdough Cookery (1977). I have tried many recipes in it. In a medium bowl mix 1-1/2 Tbsp. 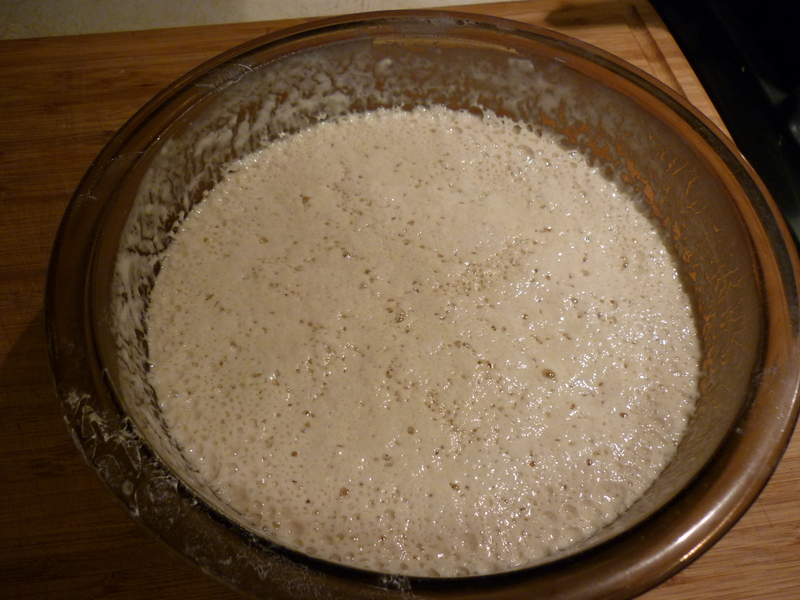 active dry yeast, 2 cups warm water, and 2 cups flour. Cover, and let mixture stand in a warm place overnight. It bubbles and then separates. I stir mine down occasionally. If you want to save your starter, keep it active by feeding it equal amounts of warm water and flour at least once per week. If you want to stop feeding it, place the starter in the refrigerator or freezer.When you’re ready to use the starter again, add equal amounts of warm water and flour and let it sit in a warm place overnight. The night before you want to make pancakes, either add 2 cups warm water and 2 cups flour to ½ cup starter or make the starter recipe above. [Remember that using the Quick, Overnight Sourdough Starter recipe doesn’t yield much sourdough flavor if used the next day.] The next morning remove ½ cup starter to save and feed for other uses. To the remaining mixture, stir in 2 Tbsp. sugar, 1 tsp. salt, ½ tsp. baking powder, and 3 Tbsp. oil. 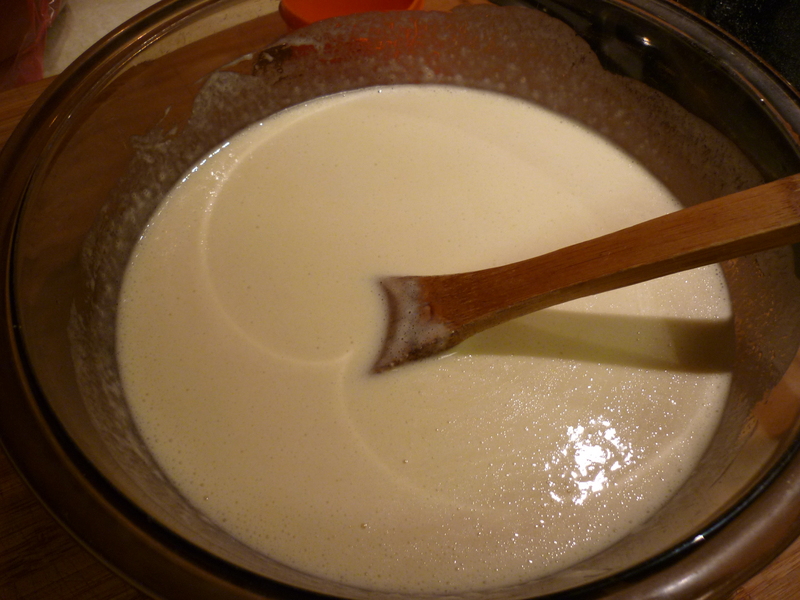 Gently fold the soda & water mixture into the batter. Do not stir it any more. 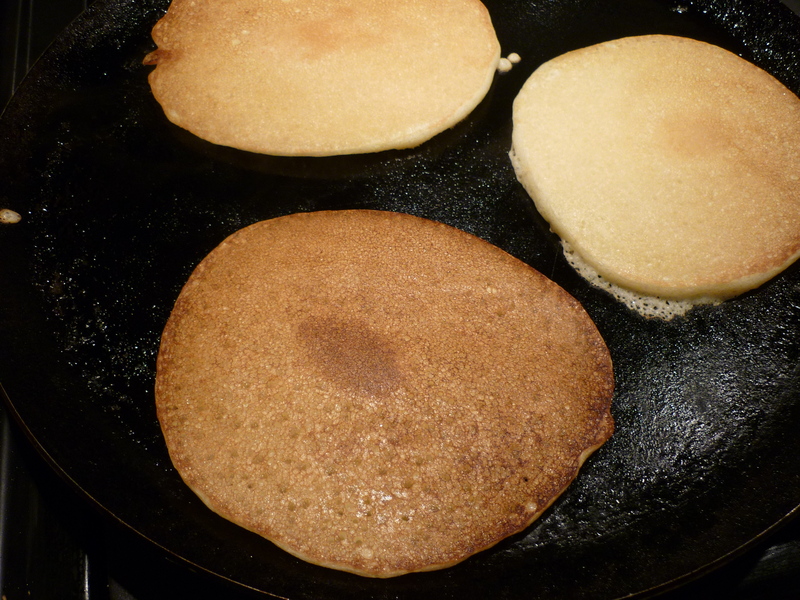 Pour the batter onto a moderately hot, greased griddle in the sizes that you wish. 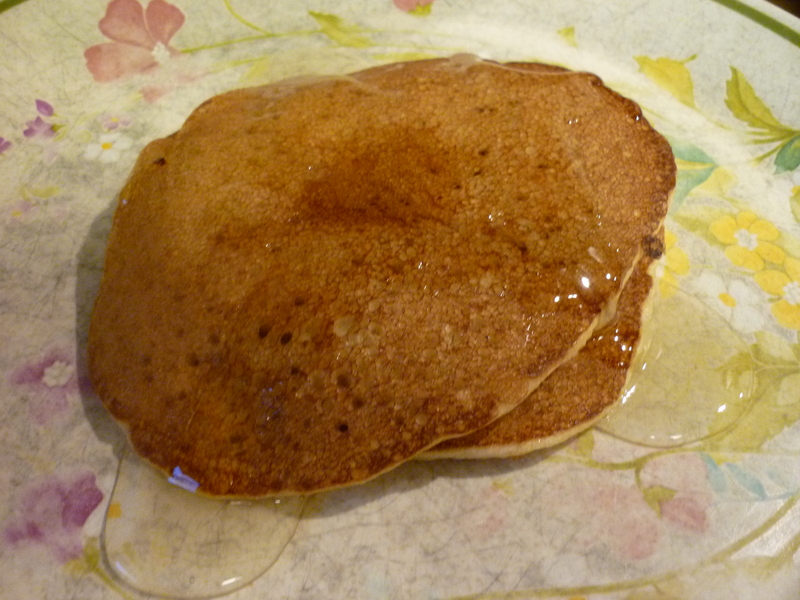 Once the edges are dry and bubbles have formed across the entire pancake, turn over. Makes 4 servings. Tastes great served with jam or jelly, syrup or honey. My kids are home from college and they’ve brought friends with them. The friends are from Sweden. We talked about the use of airplanes instead of cars in Alaska and I pulled out the Alaska maps so they could get oriented. I pointed out Nome where I was born and Naknek where I graduated high school. One girl asked if all the food was flown to Nome. They use barges for the most part, I said. When I was a young child, my mother placed her food order for the year and she got very excited when the ice moved out so the barge could come in. At this point of the conversation with the Swedes my youngest daughter started laughing. My pantry could probably feed a family for several months. I’m not a survivalist or preparing for the apocalypse, it’s just the “waiting for the barge” mentality. I have never been able to shake the food stockpile habit. My daughter laughed because her friends would come over to bake cookies or what not and they would decide to double or triple the recipe and her friends would say, “We’ll have to go to the store if we do that.” And my daughter would reply, “No, it’s no problem. Look,” and off to the pantry room they would go, to look at pounds of chocolate chips and boxes of graham crackers and cases of sweetened condensed milk. It’s not normal in this city. You can take the girl out of the Bush, but you can’t take the Bush out of the girl. That’s what I always say. So, I am cooking for a crowd of about ten people now. 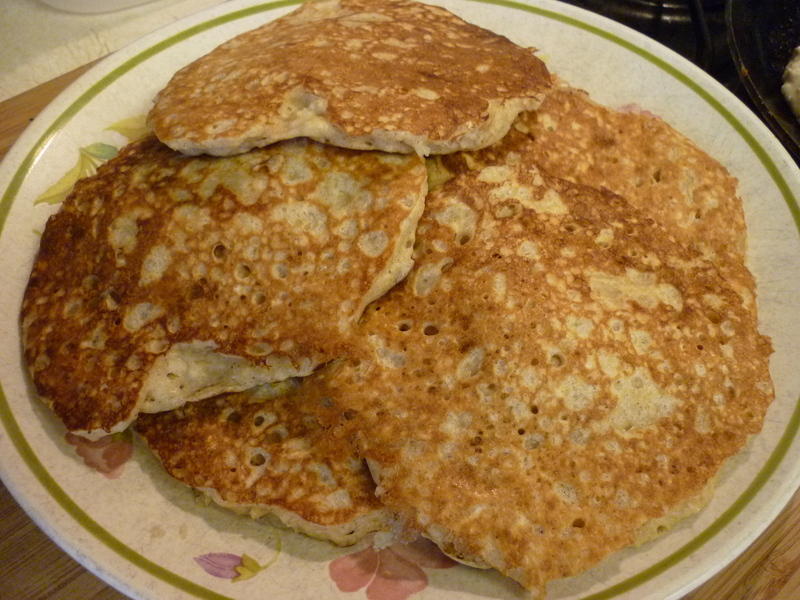 This morning I made Oat Pancakes. Please note that this must be started the night before, so planning is involved. 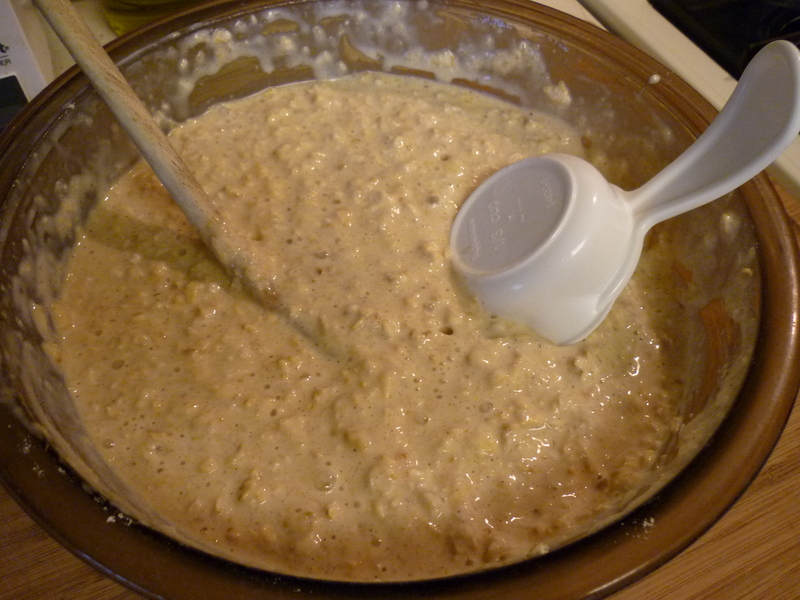 The night before, combine 2 cups rolled oats and 2 cups buttermilk. Cover and let stand in refrigerator overnight. 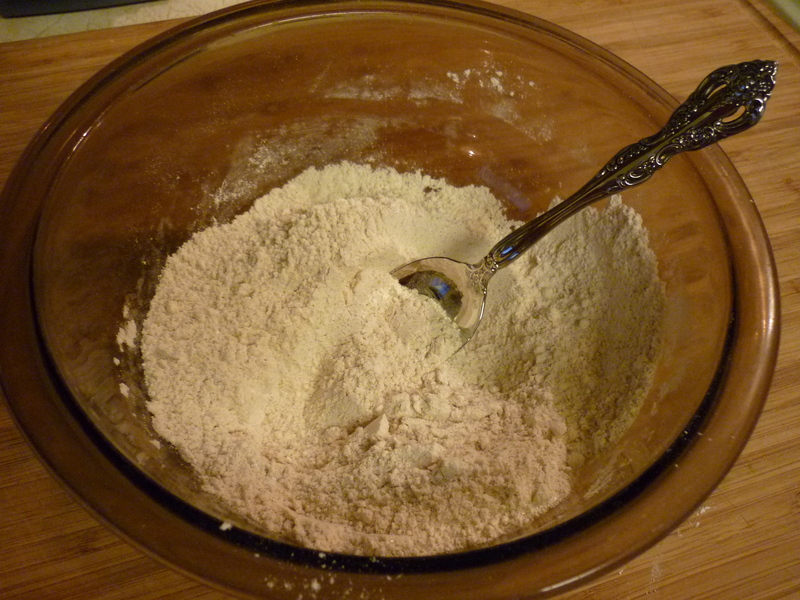 In a medium bowl stir together 1/2 cup flour, 2 Tbsp. sugar, 1 tsp. baking powder, 1 tsp. baking soda, 1/2 tsp. cinnamon, 1/3 tsp. salt. I do this part the night before as well. That way when I wake up there are only a few steps remaining. 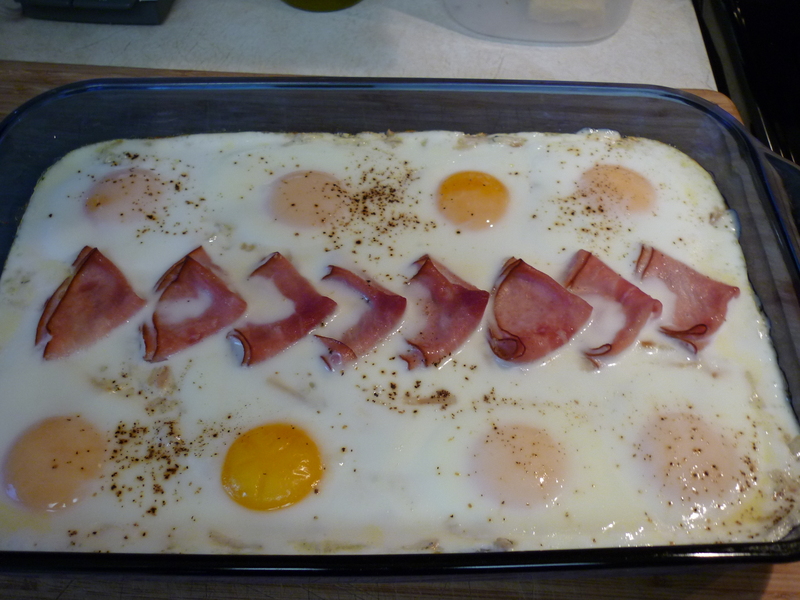 The next morning beat 2 eggs and melt 4 Tbsp (1/2 stick) butter. 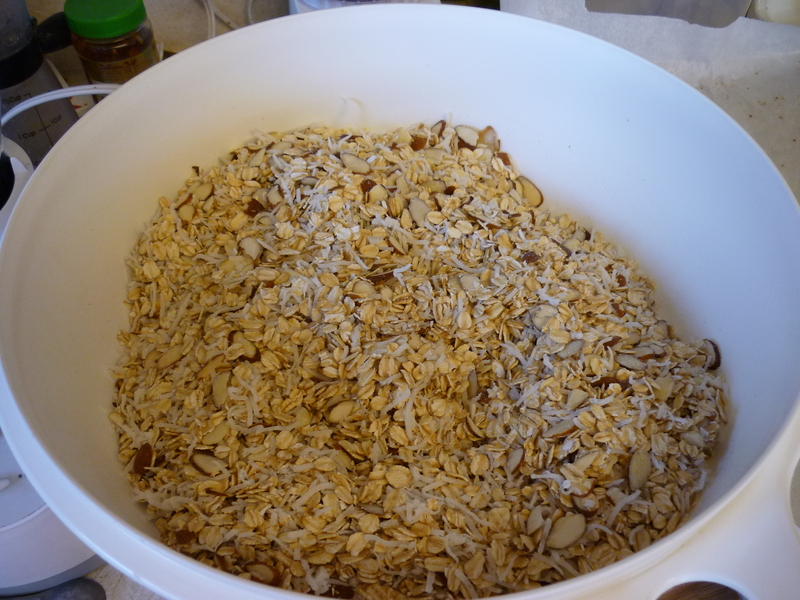 Stir into oat mixture just until blended. 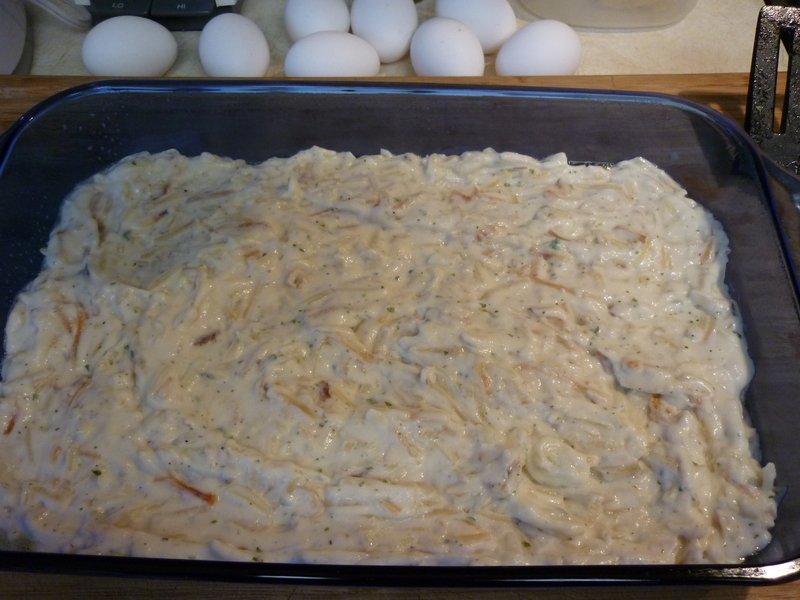 Stir in dry ingredients, just until moistened. 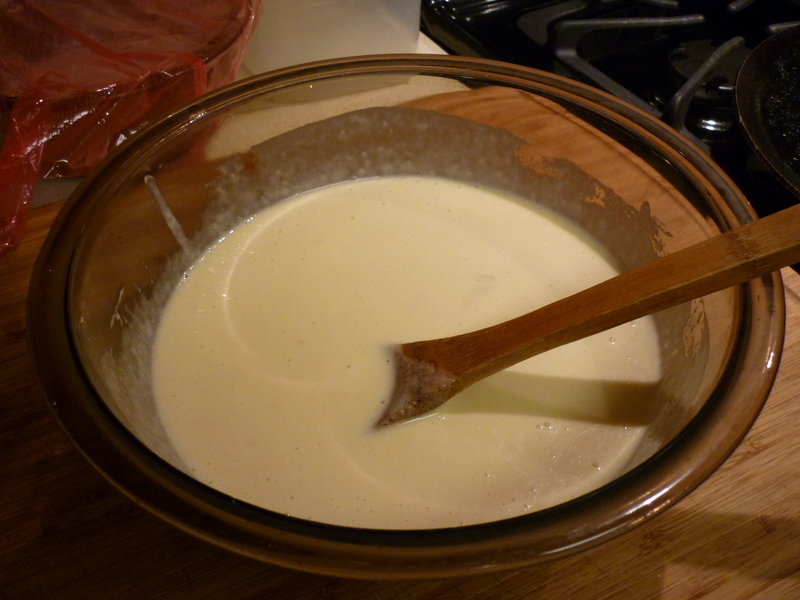 If the batter seems too thick, add a tablespoon or two of buttermilk to thin it out. Lightly grease griddle. I spray mine with canola oil. 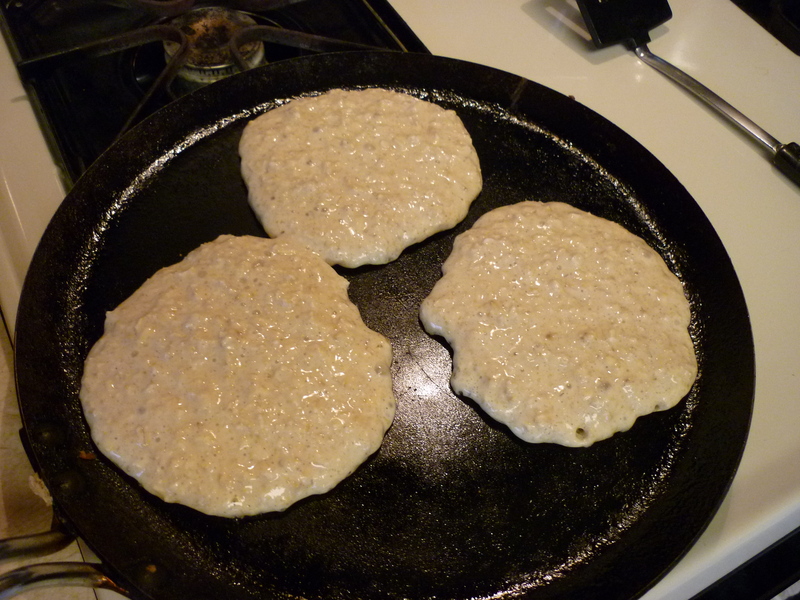 Spoon batter, about 1/3 cup for each pancake, onto griddle, and spread out to make circles about 4 inches in diameter. These pancakes cannot be hurried. There is a tendency to not cook in the middle if you try to use high heat and hurry things along. No more than medium heat should be used. It does take time. When they begin to look dry around the edges and bubbles form throughout, then flip them over. In a large bowl, combine oats and buttermilk. Cover and let stand in refrigerator overnight. 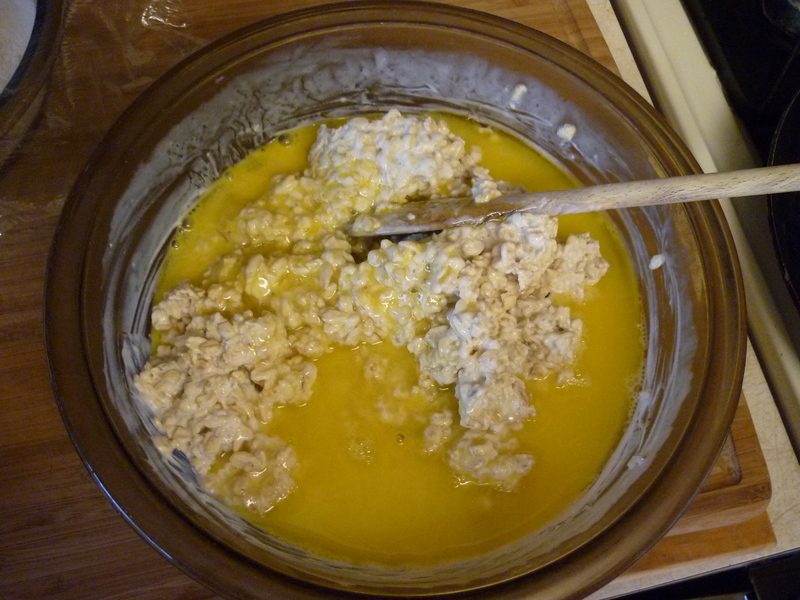 The next day, beat eggs and add to oat mixture, along with butter. Stir together just until blended. 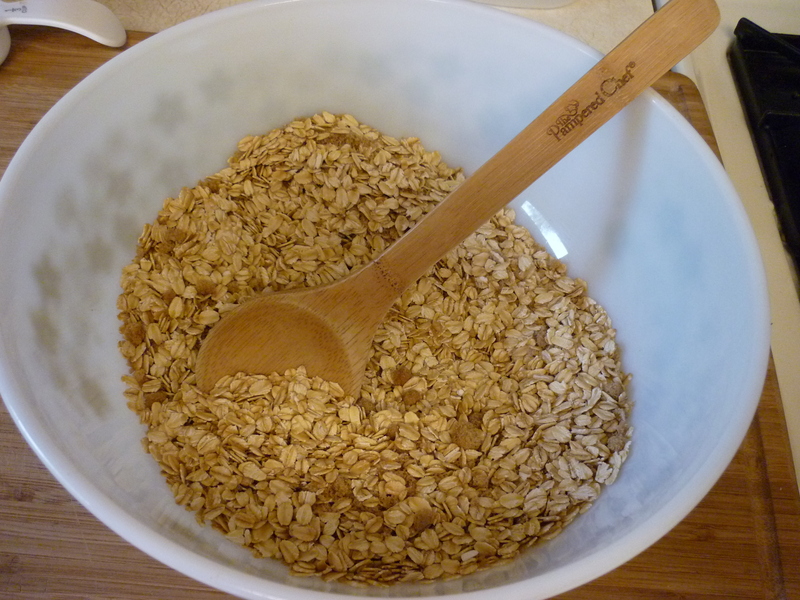 In a medium bowl stir together flour, sugar, baking powder, baking soda, cinnamon, and salt; add to oat mixture and stir just until moistened. 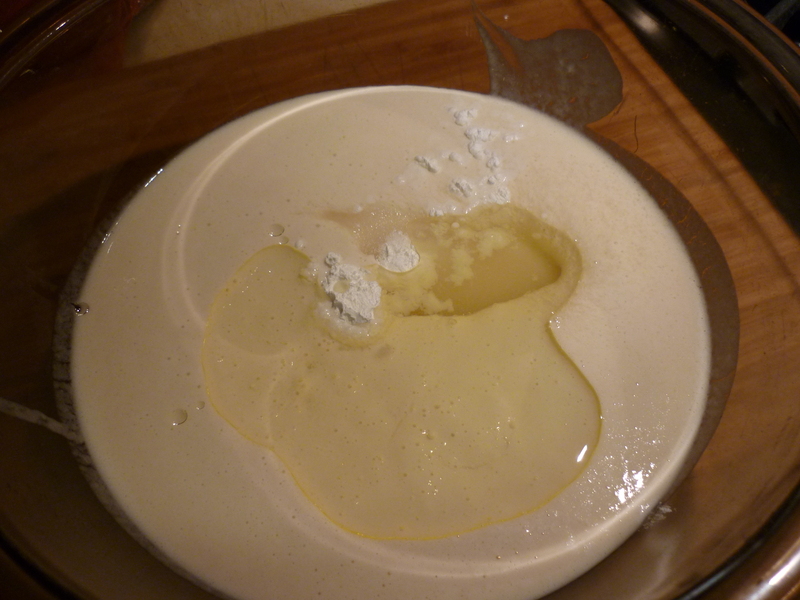 If batter seems too thick, add more buttermilk (up to 3 Tablespoons). 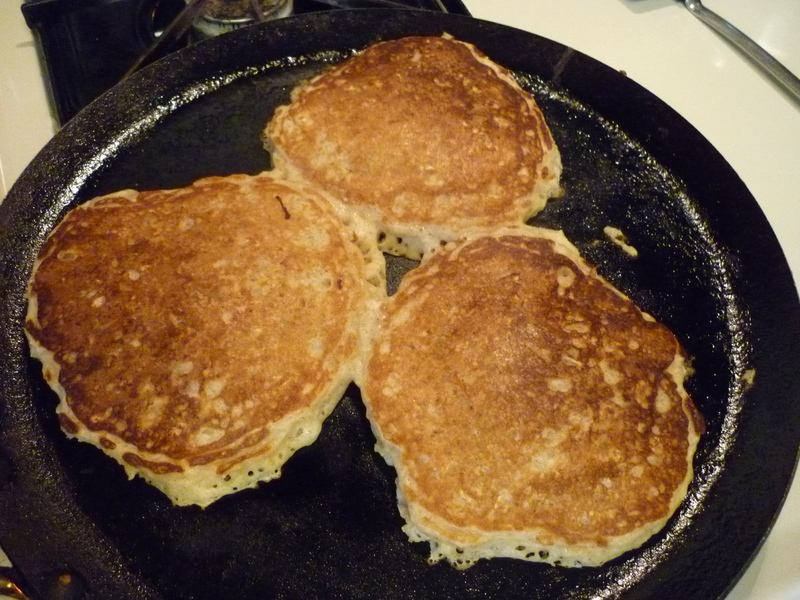 Preheat a griddle or wide frying pan over medium heat; grease lightly. 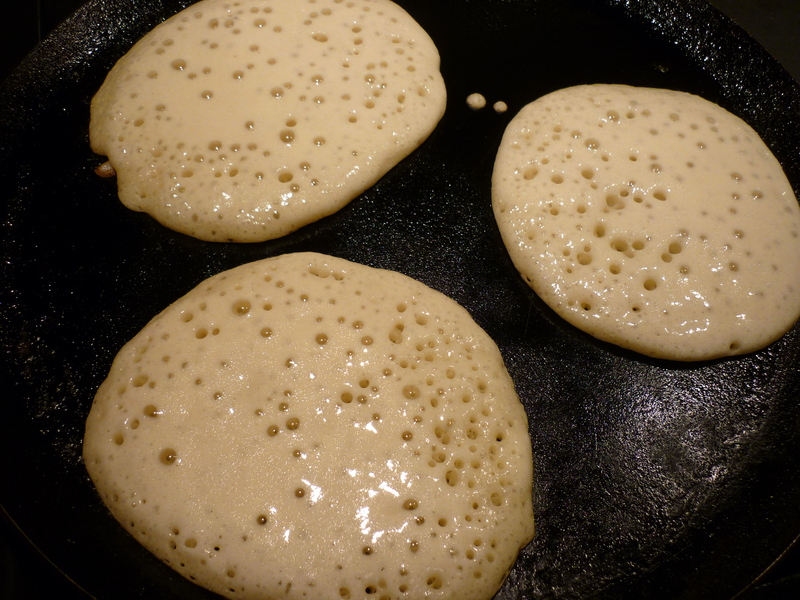 Spoon batter, about 1/3 cup for each pancake, onto griddle, and spread out to make circles about 4 inches in diameter. 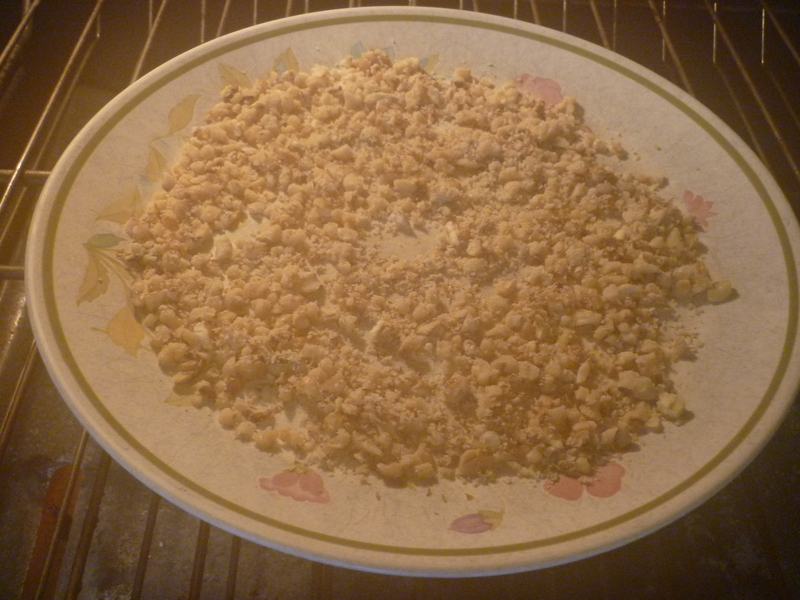 Cook until tops are bubbly and appear dry; turn and cook until other sides are browned. Makes about 1-1/2 dozen pancakes. At my house granola has been a work in progress. The whole family really likes granola. It’s easy to make. The availability of parchment paper has made it easier still. Most of the ingredients I purchase in bulk at the natural foods section of the grocery store. I’ve spent the last couple years experimenting with various recipes. 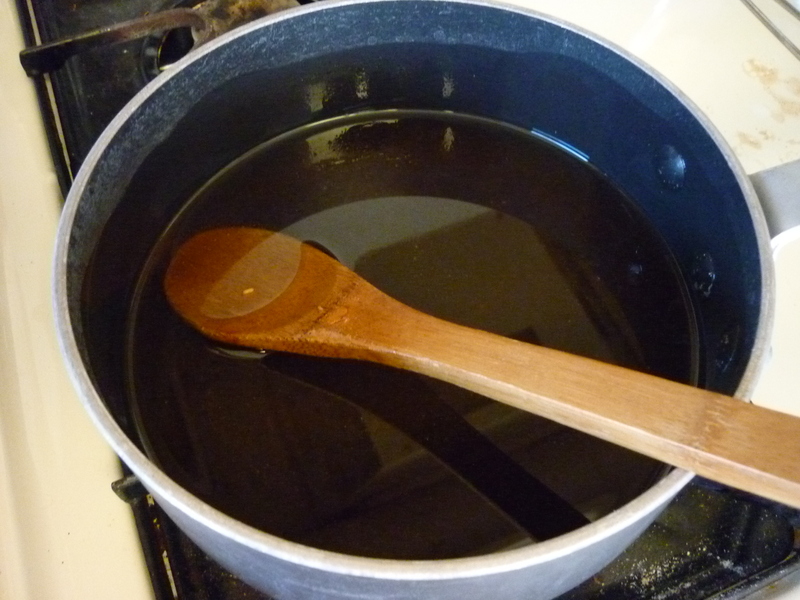 I used one recipe consistently that called for honey and had little oil. It seemed more healthy. 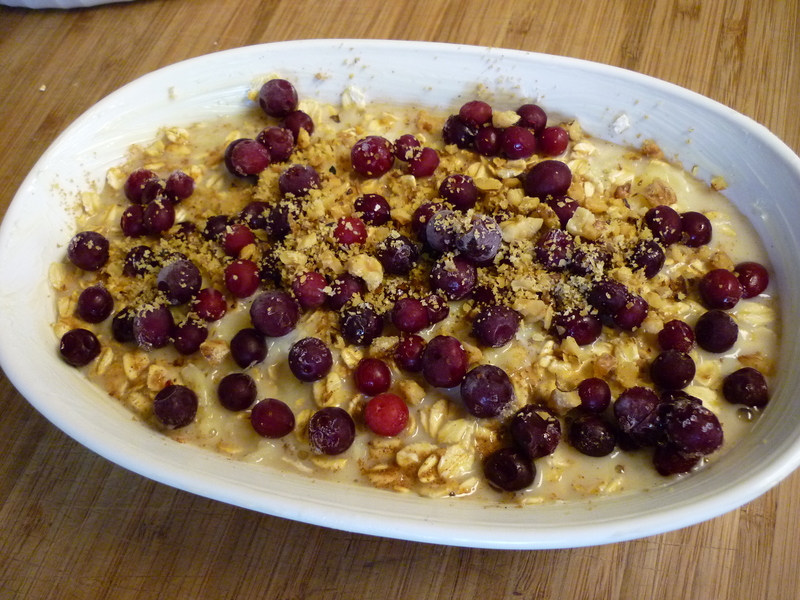 Then last summer my friend Kate gave me a recipe that was like candy and I was cured of trying to be healthy. 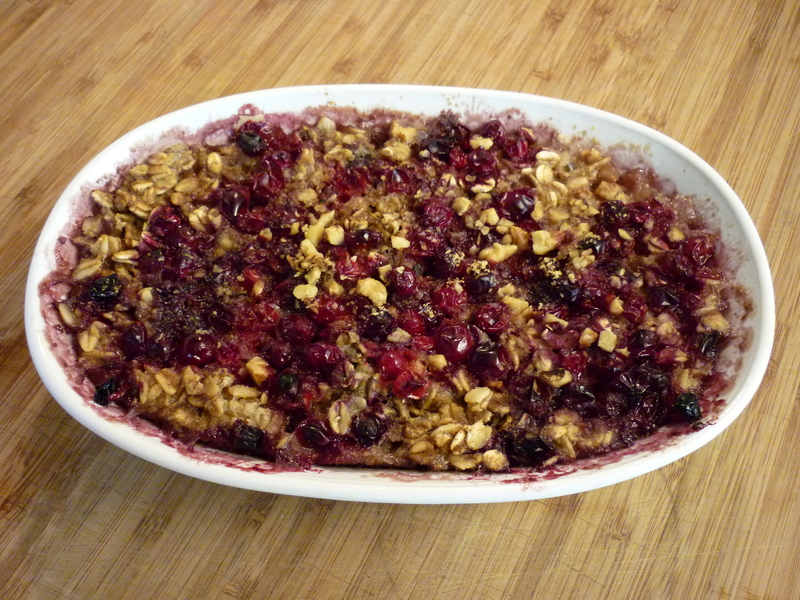 The granola was a little unwieldy because it stuck together in a glob. This did not detract from the taste whatsoever and no one cares how much trouble it is if they’re not the ones making it. The real problem with granola is that my family members eat it so quickly that I have to make it a couple times a week and it becomes a chore. And that’s using double batches. Sigh. I’ve found a new recipe to try. It’s based on Best Ever Granola at Alexandra’s Kitchen. 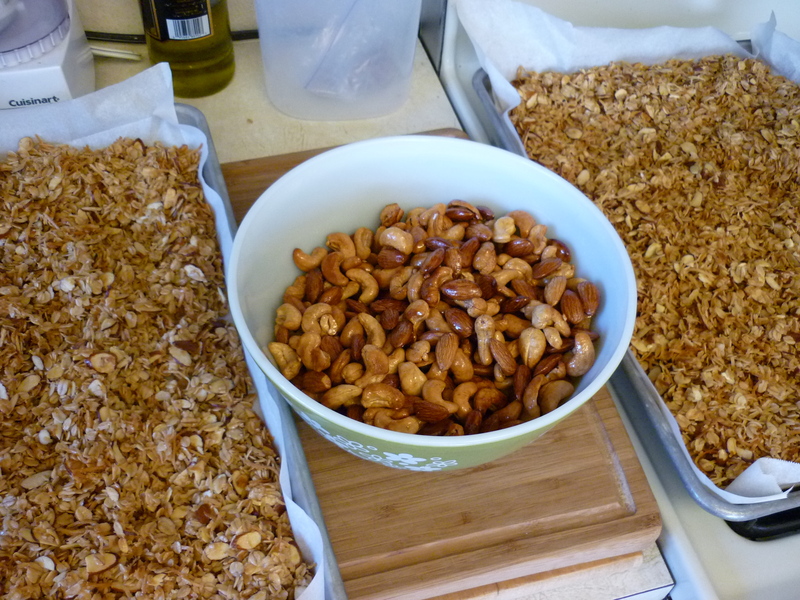 She makes candied nuts and adds them, with dried fruit, to the granola at the end. Oh, my. Two of my kids are coming home from college soon. They are bringing several visitors from Sweden. I need to stock up on food, like granola, so here goes. I’m going to give you the doubled recipe. 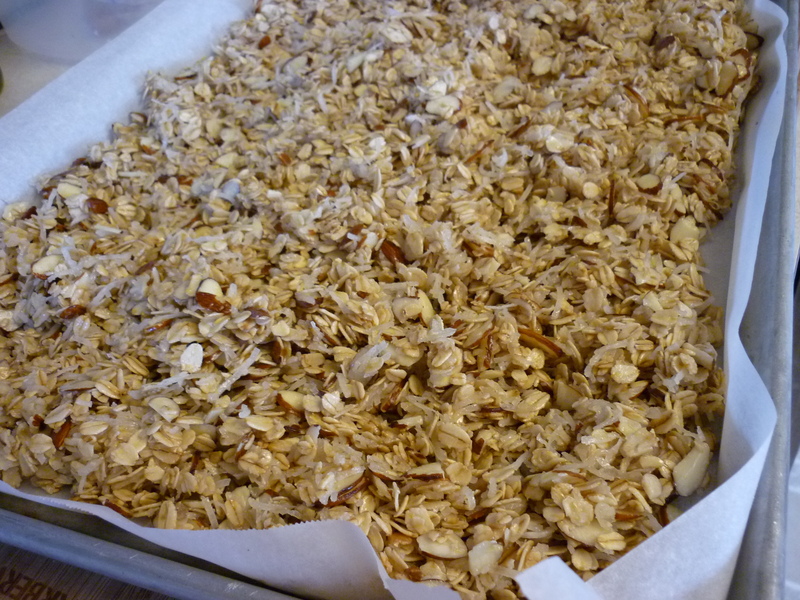 I just don’t know how normal people can make four cups of granola and call it good. Go big or go home. 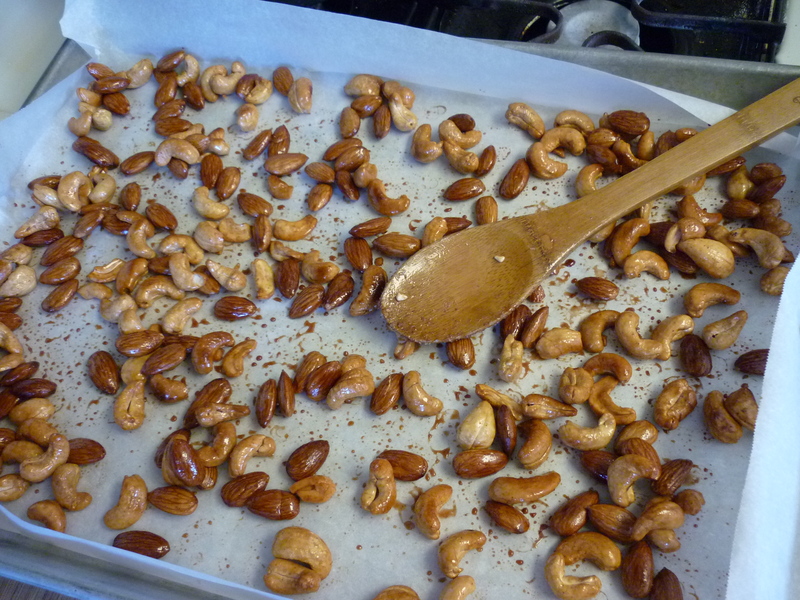 First, make the candied nuts. Preheat oven to 350 degrees. 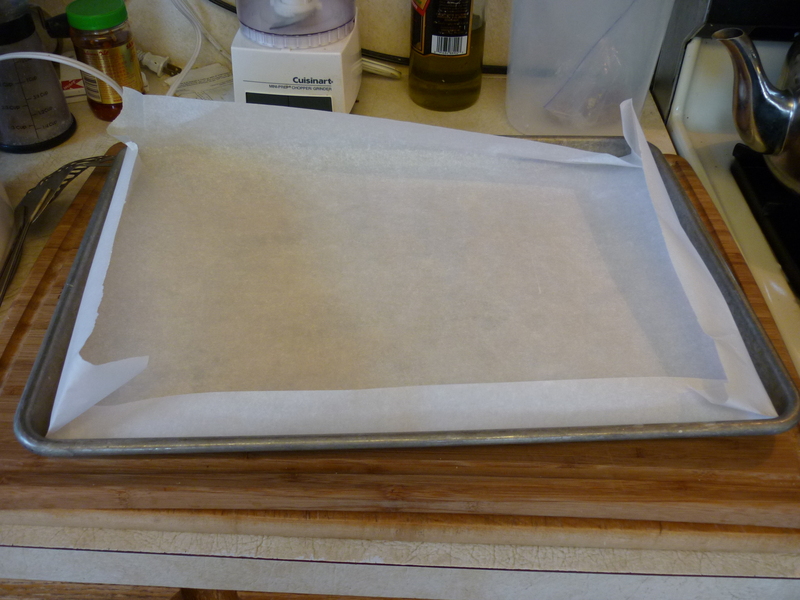 Prepare two rimmed baking sheets by covering with parchment paper. Don’t trim the paper too close, make sure to leave enough along the edges to grasp with your fingers. Prepare the pans with parchment paper. 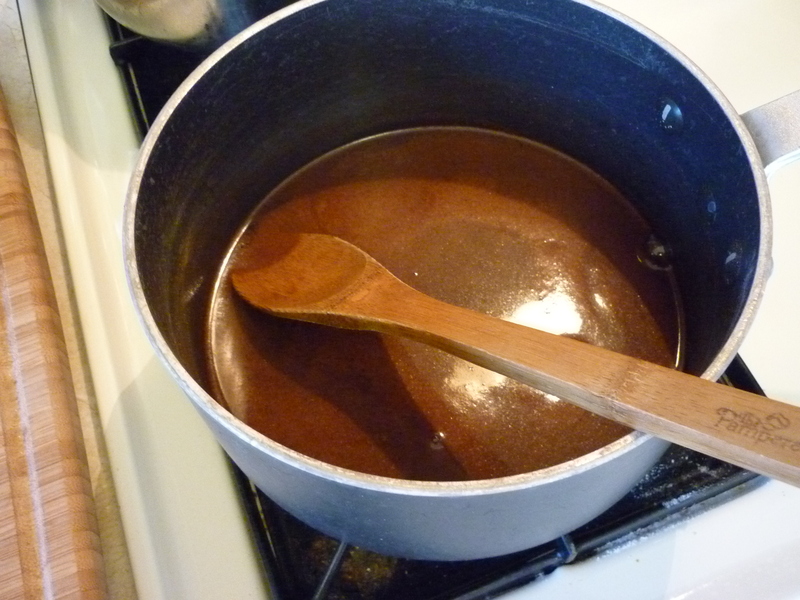 In a medium saucepan stir together 2/3 cup sugar, 1/2 cup water, 1 tsp. salt, 1 tsp. cinnamon. Bring to a boil. 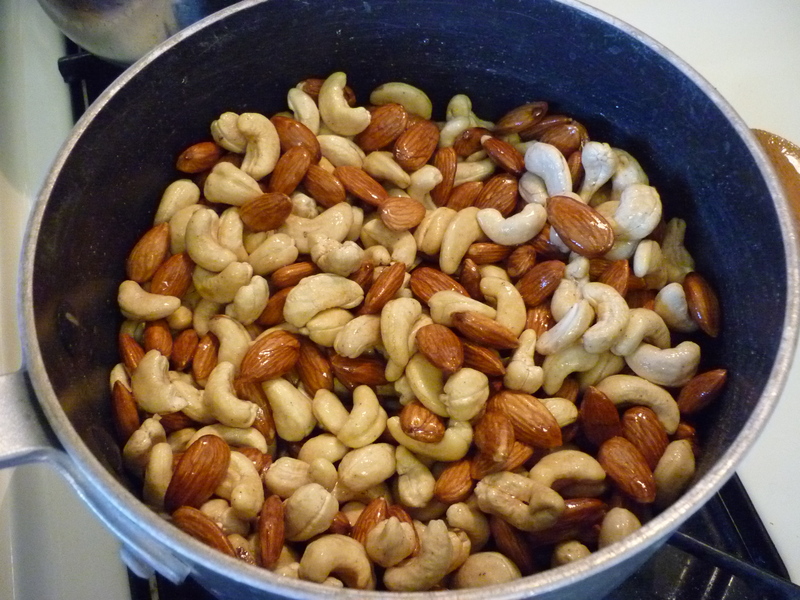 Stir in 3 cups raw whole cashews and 3 cups raw whole almonds. Let simmer one minute. 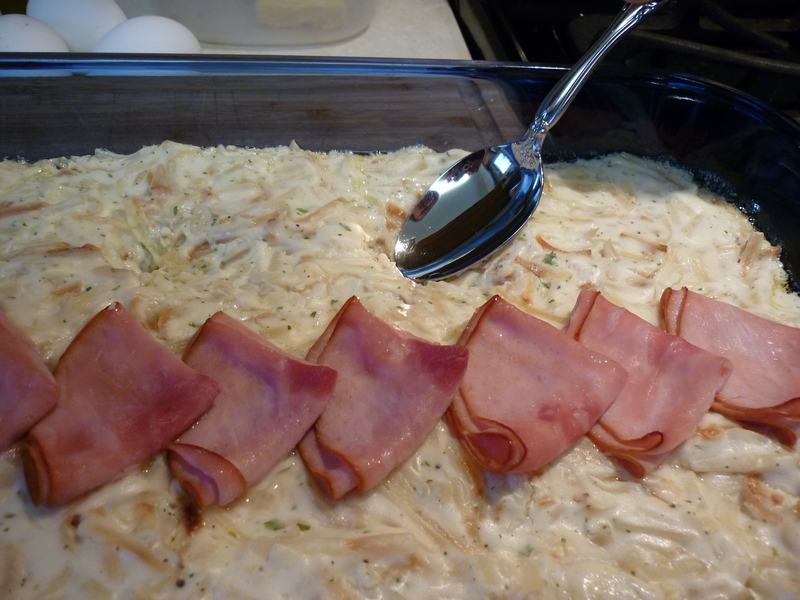 Remove from pan with a slotted spoon and distribute across the prepared pans. 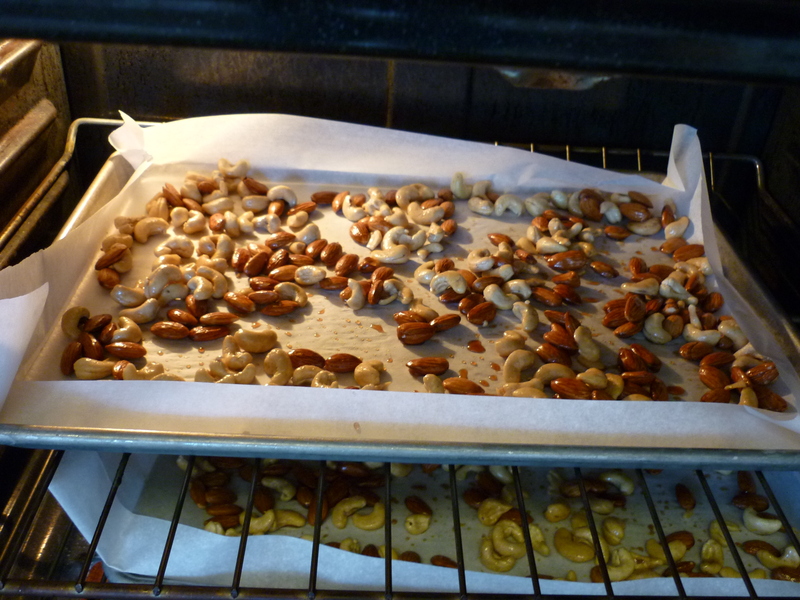 Spread nuts on paper and place into 350 degree oven for 15 minutes. Bake for 15 minutes. Remove from oven and stir around. You’ll need to hold the parchment paper between your fingers so that it doesn’t slide off the pan onto the floor while you’re stirring. The pan is hot, of course, but the paper you should be able to grip. Put the pans back in the oven for another five minutes or so. Keep a good eye on it and remove when the nuts turn golden. 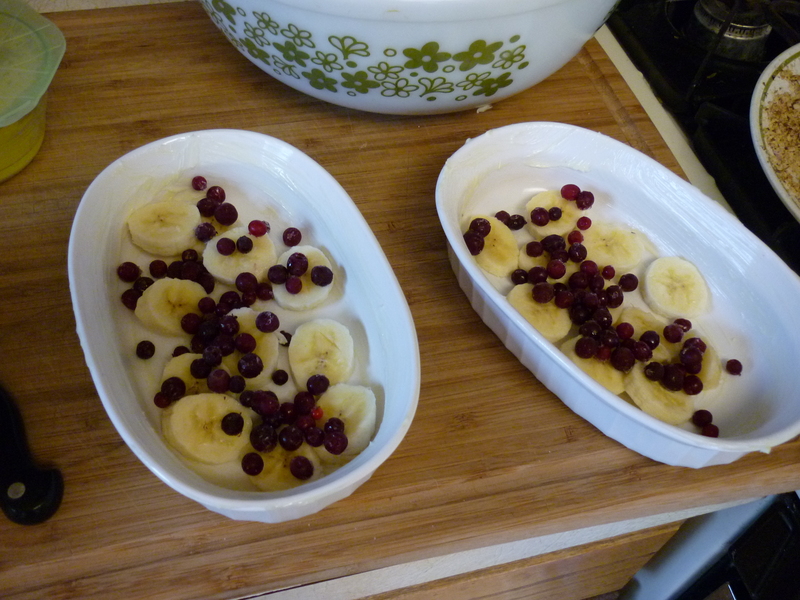 Let them cool on the pans for a little while, then transfer to a bowl. Do not throw away the paper, set it back on the pans. In a sauce pan stir together 1 cup oil (I used canola), 1-1/3 cups honey, 2 tsp. vanilla, 1 tsp. salt. Warm the mixture. 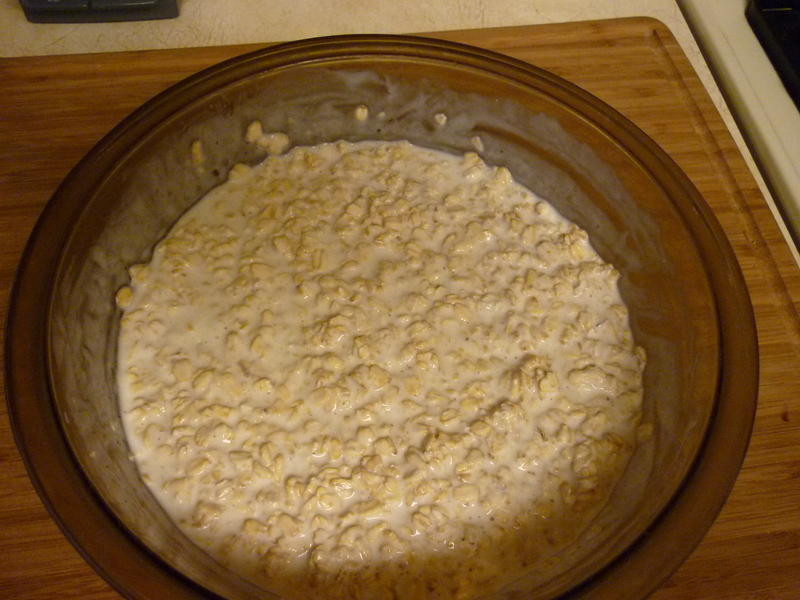 Meanwhile, in a very, very large bowl (mine is a 32-cup Tupperware) mix together 8 cups rolled oats, 14 oz. (4 cups) shredded coconut, and 4 cups sliced raw almonds. 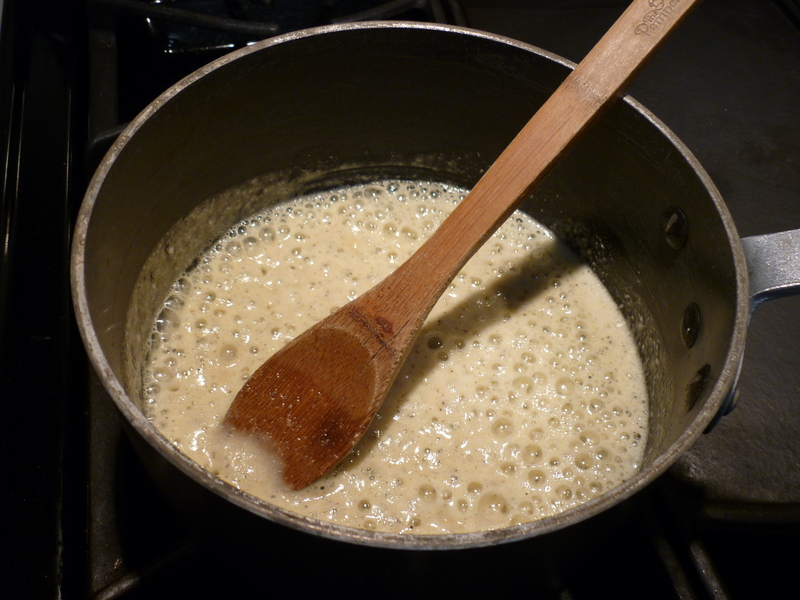 Stir in the warmed oil and honey mixture until it is mixed through. 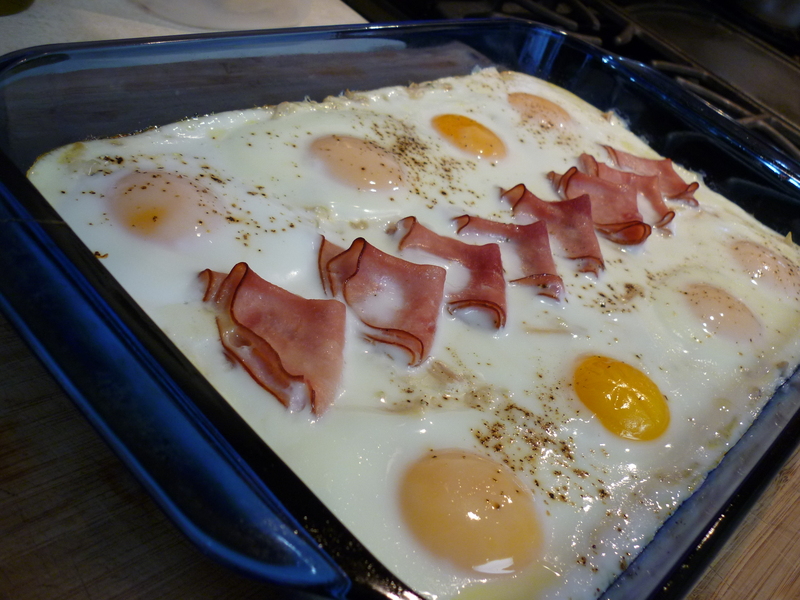 Distribute evenly across the two parchment-prepared pans. 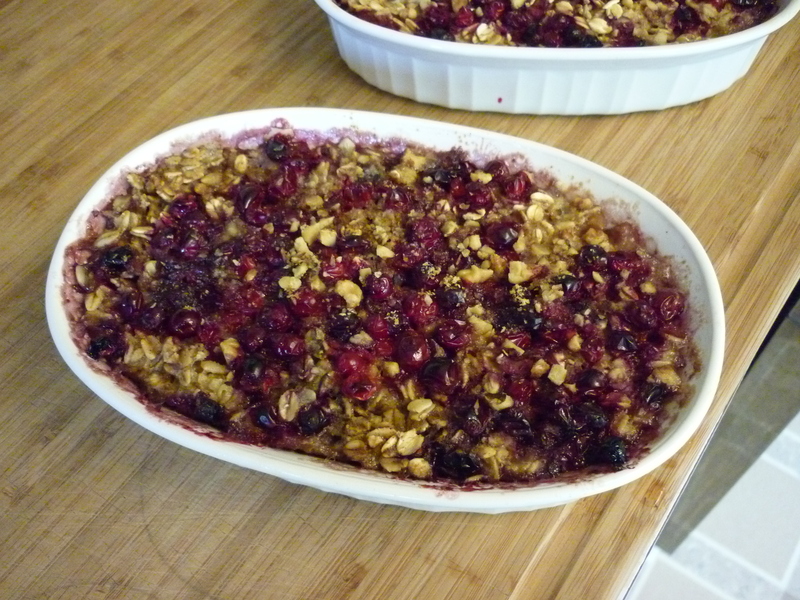 Spread granola across two prepared pans. Place in the oven to bake for 15 minutes. Remove from oven and stir. You’re trying to move the more browned parts away from the edges and under. Place back in oven for 5 minutes. Remove and stir. Back into the oven again. Keep repeating the process, reducing the amount of time in the oven until it has turned golden. 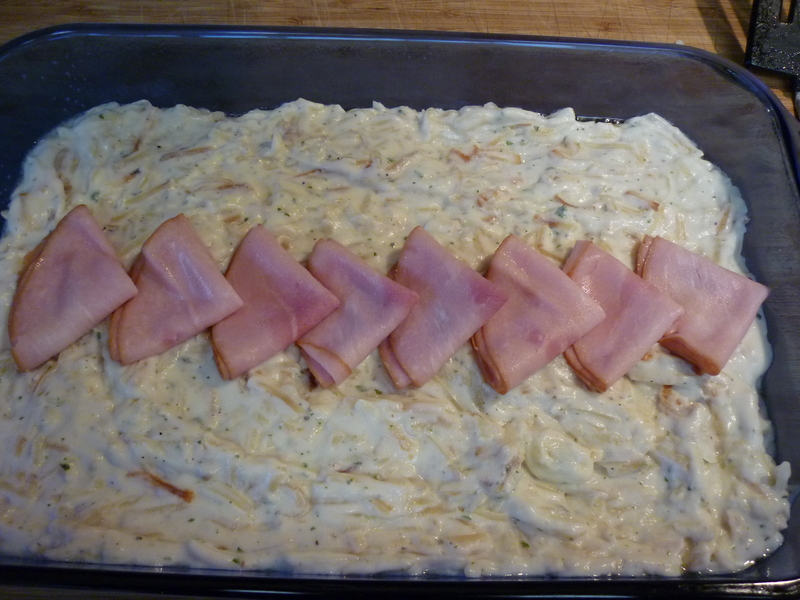 Watch it carefully, a minute or two in the oven toward the end. Let cool. Another note: try to work quickly or you’ll find that you’ve eaten all the candied nuts by the time you’re finished toasting the granola. Voila! Toasted granola and candied nuts. 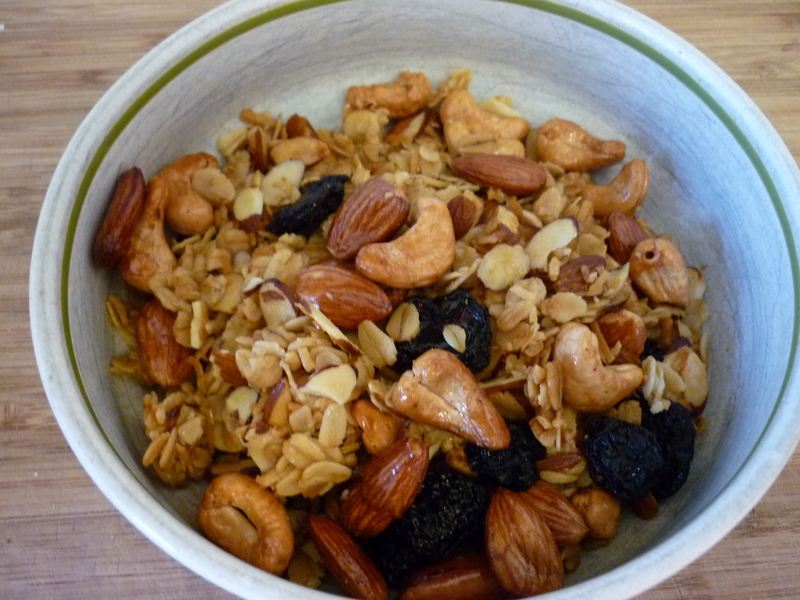 Once cool, break up the granola a little and mix with the candied nuts. 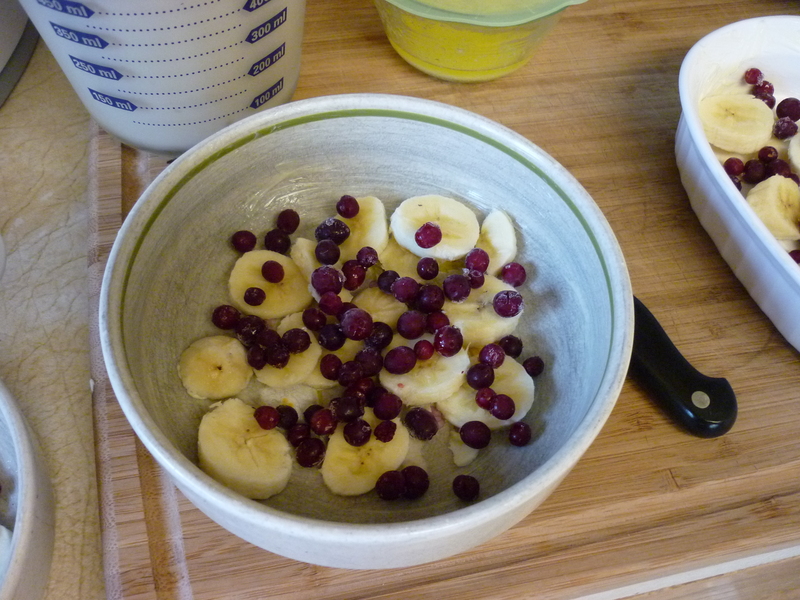 Add a couple cups of dried fruit, like cherries or cranberries. Tastes great with yogurt or milk or ice cream.